PRETORIA, South Africa, February 27, 2013 (ENS) – South Africa on Tuesday rolled out its Green Car project as part of the government’s effort to build a green economy and create jobs. “Today we launch a ground-breaking multi-stakeholder partnership project to pilot, test and demonstrate the feasibility and viability of electric vehicles under South African conditions,” said South African Minister of Water and Environmental Affairs Edna Molewa in Pretoria. Four Nissan LEAF test cars will be placed at the Department of Environmental Affairs disposal for use and testing in the initial phase of the project, to be run over three years, said the minister. The first automaker to introduce a 100 percent electric vehicle into the country, Nissan will begin sales of the LEAF in South Africa later this year. 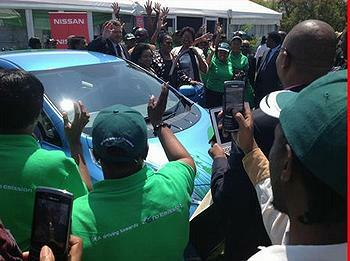 Energy Minister Dipuo Peters said at the Pretoria event that the Green Car Project is part of the government’s pledge to reduce South Africa’s greenhouse gas emissions by 34 percent by 2020. The Green Car Project will be fully powered by solar energy rather than by power from the national grid. To charge the four test cars, Molewa said her department has completed the first installation of a 15 kilowatt solar tracking device at its new premises where a green building is now under construction. The amount of electricity used for charging and running the vehicles will be monitored, logged and offset against the amount of electricity generated by the solar tracker. “It is envisaged that in future, these tracking devices will be installed on the major commuter routes for the direct charging of vehicles in real time,” said the minister. Molewa said her department will conduct an e-transport location analysis in partnership with other government agencies to inform the rollout of the solar e-cars installation package. Installation of solar-powered charging stations is planned for transportation and commuter hubs, government precincts, Gautrain stations and the OR Tambo International Airport, as well as key commercial centers and business districts. 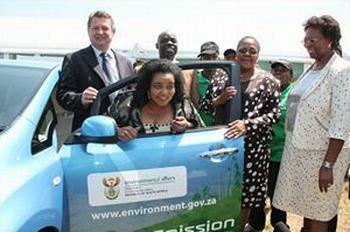 “Together with the renewable energy charge stations, the e-cars will be raising awareness of carbon neutral transportation in South Africa,” Molewa said. Globally, the minister said, electric vehicles have been on the rise, with China, the United States, Japan, Korea and Europe leading the race by launching strategies to increase the share of electric vehicles in their overall fleets. She cited automotive industry experts who forecast that 10 percent of all vehicles on the world’s roads will be electric vehicles by 2020. “The question is what proportion of this growing global green automotive market will South Africa capture? Surely the first step is to develop and grow this green car market domestically,” she said.